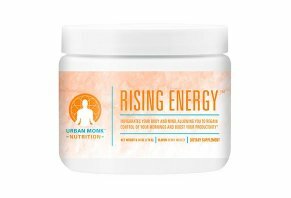 Rising Energy by Urban Monk Nutrition Reviews - Increase Your Energy? Founded by Dr. Pedram Shojai, Urban Monk Nutrition’s Rising Energy dietary supplement claims to naturally increase physical and mental energy that lasts throughout the day. Rising Energy by Urban Monk Nutrition Review - Increase Your Energy? The website advertises Rising Energy by Urban Monk Nutrition as an exotic formula of non-jittery ingredients that delivers a tremendous boost of all-day energy, improves focus and alertness, boosts productivity, and invigorates body and mind. Together, we’re told this Berry Medley-flavored “powerhouse combination of herbs and extracts” will allow you to regain control of your mornings, prime your body for fitness and performance, and to do all of the activities you love. All you have to do is mix one scoop of Rising Energy with water or your favorite beverage, with or without a meal, at any time during the day. The company tells us that anyone who cares about the optimum functionality of their body can safely use the supplement since it contains only 100% natural ingredients tested for quality and purity at an independent, third-party facility. At these prices, though, can you realistically expect Urban Monk Nutrition’s Rising Energy dietary supplement to deliver a high level of value? That’s the central question we’ll focus on in this article, starting with a few basics. We’ll all felt low on energy before, whether caused by a particularly stressful day, a lack of sleep, overexertion while working out, or a less-than-stellar diet, to name just a few. Sometimes, it’s a combination of all of the above, although once life returns to normal, the situation typically remedies itself after a day or two. The Cleveland Clinic reports that if you’re experiencing ongoing, or chronic, fatigue that doesn’t let up after a few days, additional underlying causes could be missing nutrients in your diet, vitamin D or omega-3 deficiency, ongoing stress and sleeplessness, and a sedentary lifestyle. Based on these varied causes, whether you're thinking about taking a supplement like Rising Energy to boost your energy levels throughout the day or a different tactic, it's important first to address the underlying issue, which is something you can only accomplish with your doctor's help. Then, based on your diagnosis, they can recommend science-backed options that are most likely to deliver the highest value for the money. When it comes to Rising Energy, what ingredients will you talk to your healthcare provider about? “Not only does guayusa possess the same amount of caffeine as a cup of coffee, [but] it also contains theobromine, which tempers the jitters caused by overuse. With double the antioxidants of green tea, it's also believed to possess incredible curative properties, many of which have yet to be discovered." Healthline indicates that one shilajit study from 2012 on rats found those given the ingredient for 21 consecutive days displayed reduced symptoms of chronic fatigue syndrome (CFS). The researchers “think this was the result of the shilajit helping to prevent mitochondrial dysfunction,” they say. According to the clinical evidence summarizations provided by sites like WebMD, the Natural Medicines Database, and Examine.com, taking between 200 mg and six grams of schisandra extract or tea made from crude leaves daily may help improve concentration, attention, and speed of thinking. Finally, 2 g of chlorella three times daily may help prevent pregnancy-related anemia caused by iron deficiency. Outside of this, these sites report there’s insufficient clinical evidence to support Urban Monk Nutrition’s advertising claims for Rising Energy. Are There Any Potential Side Effects When it Comes to Rising Energy’s Ingredients? The Stash Tea blog, The Daily Beast, and Healthline don’t report any side effects related to guayusa, shilajit, or schisandra. In fact, they point out that researchers think it's possibly unsafe when taken for longer than six months, since it may have hormone-like effects on the body. Chlorella can also lead to gas, stool that’s discolored green, and skin that’s extra sensitive to sunlight, while rhodiola can cause dizziness, dry mouth, or excessive saliva production. However, they indicate it’s unknown if the long-term use of rhodiola (more than six to 10 weeks), holy basil (up to six weeks), or theanine (more than three weeks) is safe. This is why the Urban Monk Nutrition website recommends consulting with your healthcare provider before starting any dietary supplement, Rising Energy or otherwise. How Much Does the Rising Energy Powder Cost? Regardless of the price you pay, all orders come with a 90-day money back guarantee, less S&H, even if the jars are empty. To request one, customers can call 855-295-8710 or send an email to support@urbanmonknutrition.com. Who is Dr. Pedram Shojai? Do You Need to Take a Dietary Supplement Like Rising Nutrition? Based on what we learned from sites like WebMD, Healthline, and the Natural Medicines Database earlier, several ingredients found in Rising Energy could naturally (and temporarily) achieve Urban Monk Nutrition’s energy and mental-related claims for Rising Energy, including guayusa, shilajit, schisandra, Panax ginseng, and chlorella. After searching online, the only third-party dietary supplement we encountered that contained many of these same ingredients was GAIA HERBS Ginseng/Schisandra Supreme ($16; rhodiola, holy basil, ginseng, and schisandra), although it was available only as liquid drops. Outside of this, we came across a handful of standalone guayusa dietary supplements sold via third-party vendors on sites like Walmart.com and eBay, typically priced between $20 and $40. We also found dozens of loose leaf guayusa tea blends, most of which fell somewhere between $5 and $25. Zooming out and taking a look at the bigger picture, though, can you expect Rising Energy, or any third-party options, to deliver meaningful benefits for the money? In general, organizations like the National Institutes of Health, Nutrition.gov, Harvard Health, and the American Academy of Family Physicians (to name just a handful) indicate that otherwise healthy individuals do not need to take dietary supplements. If you’re experiencing energy problems or brain fog on a regular basis, what’s the best way to figure out if you fall outside the spectrum of ‘otherwise healthy’? Make an appointment with your doctor. Prepare yourself to have an in-depth conversation and perhaps undergo testing. Based on these details, they can formally diagnose you, recommend a treatment plan that’s medically sound, and help you minimize potential side effects and medication interactions. Just keep in mind that even if a health issue is contributing to your fatigue, this doesn’t necessarily mean that every (or any, for that matter) dietary supplement will deliver relief. The Bottom Line – Should You Buy Rising Energy Drink by Urban Monk Nutrition? Urban Monk Nutrition's Rising Energy supplement comes from a self-help personality with a high degree of public visibility and is manufactured by a Better Business Bureau-accredited business who held an A- rating and no closed complaints, as of 9/19/18. They also promise to stand behind all orders with a 90-day money back guarantee, less S&H, if you decide to give it a try and find that it doesn’t meet your needs or preferences. As consumers ourselves, though, if your doctor gives you a diagnosis-based green light, it only makes sense to order the meaningfully less expensive options from the company’s EnergyWillRise.com website. Write a Review for Rising Energy by Urban Monk Nutrition!